A used or new 5-gallon bucket. One yard of sturdy fabric such as denim or canvas. 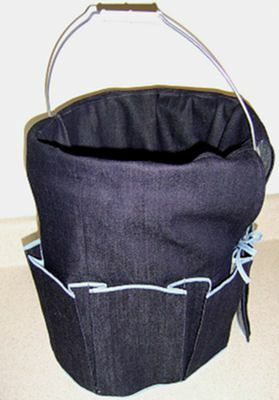 These pattern instructions contain the measurements used for the bucket described in the materials needed and instructions to create a pattern for any size bucket. Cut one circle that is 11" across. Trace the bottom of the bucket on the fabric -- add 1/2" to the outside of the circle. Cut out at the outer marking. This piece is wider at the top than at the bottom. Start with a Rectangle that is 15" X 39". Fold this rectangle in half. On the bottom of the rectangle, measure 7 1/2" from the fold and make a mark. Join the mark to the top outer 39" edge. Trim the pattern to the finished size. Create a pattern piece similar to the one shown using your measurements. Measure around the bucket at the top (A) and divide the measurement in half, then add 1" for seam allowances (A). Measure the height of the bucket and add 1" for a 1/2" seam allowance at the top and bottom (B). Cut two rectangles A X B. Cut two 7 1/2" X 38" rectangles. ​Create a pattern by using the outside of the bucket pattern piece. Create a rectangle that is double the width of A by 7 to 8" for the height of the pocket. Apply bias tape to the upper edge of both pocket sections. Mark 1/2" in on each end. Fold the pocket section into four sections, not including the 1/2" marks at the ends. Mark the folds with gentle press lines or chalk. Mark 1/2" in from the sides on the outside wall pieces and fold them into four even sections as you did the pocket sections. Match up the ends and bottom of the outside wall and pocket piece. Sew the pocket section to the outside wall section on the fold lines and the edge 1/2" marks. Pleat and press the sides of each pocket section so the pocket fits the area. Top stitch the edge of each outer pleat. Baste the bottom of the pocket to the outside wall piece. Turn under the sides 1/4" and 1/4" again to enclose the raw edges. Carefully top stitch the hem in place, not stitching the pocket. Enclose the bottom edge with bias tape, turning under the ends to enclose the raw edges. Repeat for the other outside wall and pocket piece. With right sides together, sew a seam in the height edge of the inside wall section, using a 1/2" seam allowance. Fold the outside wall section, into four even section. Mark the folds with chalk or by gently pressing. Fold the inside bottom circle into four even sections. Mark the folds with chalk or by gently pressing. With right sides together, match the fold marks on the outside wall piece and the inside bottom circle piece. Join the pieces, using a 1/2" seam allowance. Press the seam and apply a seam finish. Using the side seam of the inside wall piece as a starting point, placing right sides together, pin the outside wall pieces to the inside wall pieces. Distribute any extra space between the outside wall pieces evenly. Sew using a 1/2" seam allowance. Apply a seam finish to the raw edge. Press the seam so that it lies on the inside wall piece. Top stitch, an even distance from the seam, to attach the seam allowance to just the inside wall section. Sew near the unsecured folded edge of the remaining bias tape to hold the layers together. Divide the tape into two even pieces. Repeat the dividing process to have four even pieces. Attach one end of each tie on the back side of the outside wall section at the top of the pocket section. Turn right side out and place inside ​the bucket. A used or new 5-gallon bucket - The bucket used for this project measured 14" high and 12" across the top and 10 " across the bottom. Available in paint departments. Cut two 15" X 19" rectangles. Cut two rectangles A X B. Create a pattern by using the outside of the bucket pattern piece. Turn right side out and place inside the bucket. Sew a Classy Fabric Handbag with Two Two Fabric and Loads of Pockets!